When Apple announced that the new Apple TV would come with its very own App Store, expectations reached a whole new level for what would be possible once developers got their hands on the thing. Now, after being able to develop for the device for a few months, we are starting to see some awesome apps arrive, and Remote Buddy Display is another fine example. As the name might suggest, Remote Buddy Display is an app that allows the remote control of a Mac, but what makes this app so interesting is that it runs on the new Apple TV, turning the TV that it is connected to into a massive Mac display. That’s cool in itself, but there’s more. Being able to throw a Mac’s display onto a big TV is nothing new thanks to the wonders of AirPlay, but where that technology falls short is the fact that the Mac cannot be controlled remotely, that is, the Apple TV and AirPlay simply create a wireless external monitor with which to view the Mac’s desktop. Where the new Apple TV and Remote Buddy Display differ from AirPlay is that this app allows the Apple TV’s Siri Remote to be used to control the Mac, turning the Apple TV into a Remote Desktop solution. The app doesn’t transmit audio, though, at least not yet. The beauty of the Siri Remote is its touch-sensitive control pad, and that lends itself just fine to being used as a trackpad. Furthermore, pressing the Menu button on the Siri remote not only brings a Help menu up on-screen, but also allows for a virtual keyboard and other shortcuts to be used depending on the app that is in use. Lean back, connect to your Mac right from your Apple TV and control it with the remote in your hand. Skip the cloud and beam all the photos, presentations, documents and other visual content on your Mac directly onto the big screen. 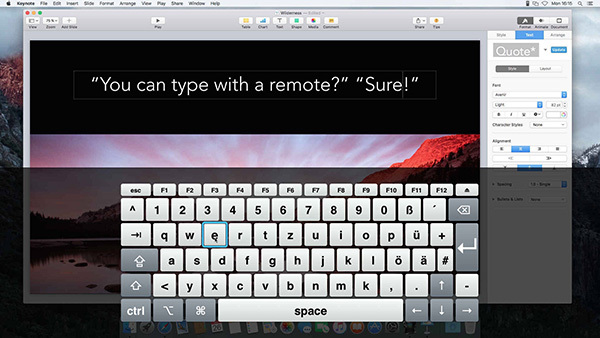 Turn your Siri Remote into an awesome presentation tool with Mouse Spot. 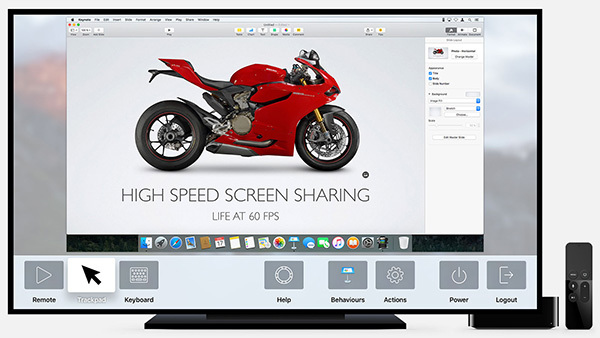 Connect your Apple TV to a projector in your conference room and use it as a shared Mac display and remote control solution for the whole team. The Remote Buddy Display app for Apple TV is free, while the desktop portion of the solution costs around $27 depending on the exchange rate, but there is a free 30-day trial so you can give the thing a whirl before spending your money. We think you’ll be handing your credit card details over long before those 30 days are over, though. You can purchase the OS X app or download the free trial from iospirit.com/products/remotebuddy/. The tvOS app can be searched for on the App Store from within Apple TV.